Many early steam locomotives were of the 0-4-0 wheel arrangement. 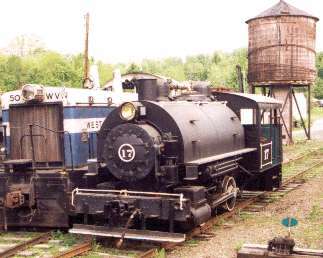 0-4-0 switchers were used on many US railroads. Both tender and tank designs were common. 0-4-0T 36" Standard Turpentine unknown, Decatur, AL unknown H.K. Porter, 1911 From SCM Glidco Organics then N FL Chapter NRHS, Jacksonville, FL. Was this locomotive purchased by Ken Riddle? 6 (2) 0-4-0F 36" Apache Powder (Burton Explosives) Arizona State Railroad Museum, Williams, AZ stored H.K. Porter #7197, 1930 From Flint, MI. 5x10 0-4-0CA 36" Hidden Splendor Mine park, Auburn, CA display H.K. Porter #4560, 04/1910 Possibly at the Gold Country Mining Museum. 3 0-4-0T 4'-8½" Edison Portland Cement Silverbend Farms, Clarksburg, CA stored operational Vulcan Iron Works (Wilkes-Barre) #3370, 1923 Fron San Jose, owned by Louis R. Chiaramonte? 459 0-4-0CA 24" Empire Gold Mine State Park, Grass Valley, CA display Universal Dredge Mfg. 151 (1) 0-4-0ST-T 4'-8½" Imperial Irrigation District Pioneers Museum, Imperial, CA display ALCO (Cooke) #59389, 10/1918 Acquired CP slope back tender. 0-4-0CA Judge Raymond Drake, Cripple Creek, CO private Universal Dredge Mfg. 0-4-0CA Mollie Kathleen Gold Mine Judge Raymond Drake, Cripple Creek, CO private Universal Dredge Mfg. 0-4-0CA Mollie Kathleen Gold Mine Mollie Kathleen Gold Mine, Cripple Creek, CO private Universal Dredge Mfg. 8 0-4-0WT-T 600mm Gruen & Biflinger AG Keith Valesh, Oelwein, IA private Henschel & Sohn (Kassel) #22631, 1935 From James Valesh, Milwaukee? 0-4-0CA Crystal Gold Mine, Kellogg, ID unknown Universal Dredge Mfg. 75 (2) 32ton 0-4-0ST 4'-8½" Flagg Coal (Solvay Process Works) Gramling Locomotive Works, Ashley, IN out of service Vulcan Iron Works (Wilkes-Barre) #3972v, 1930 Hamed Hank. 19B 0-4-0T ng D&HR Hesston Steam Museum, Hesston, IN gone Once named India. Sold to individual in SE UK. 12 0-4-0ST 24" Lord Penrhyn Slate Quarries (Durham County Water Board) Tony Hulman estate stable, Terre Haute, IN gone Avonside Engine (Bristol) #2066, 1933 Named Ogwen. In 2012 moved to Beamish Museum, Beamish, County Durham, UK. 0-4-0T 4'-8½" Portland Cement Wilson County Old Iron Club, Fredonia, KS display Davenport Locomotive Works From Lafarge Corp.
11 0-4-0T 24" Maine NG Railroad & Museum, Portland, ME private operational Henschel & Sohn (Kassel) #22826, 1935 From Germany. Current whereabouts unknown. De Witt Clinton 0-4-0 4'-8½" NYC Henry Ford Museum, Dearborn, MI display NYC, 1893 Replica built from fragments of the original which was built in 1831. 28 (9) 0-4-0T 36" Wanamie Colleiry (Glen Alden Coal) Vierson Boiler Works, Kentwood, MI display Vulcan Iron Works (Wilkes-Barre) #2484, 1916 From Mt. Pleasant, IA then Salem, OR. Possibly going to the Huber Breaker Museum, Wilkes-Barre, PA.
HF2064 0-4-0T 24" German Army Silver Dollar City, Branson, MO unknown Henschel & Sohn (Kassel) #15918, 1918 Named Feldbahn. I have confirmation that this locomotive was never at SDC. 57 0-4-0T 4'-8½" Solvay Process Works NE Missouri Old Threshers, Shelbina, MO operational ALCO (Cooke) #64991, 1923 From Leo Smasal, Sedalia? 0-4-0T 4'-8½" farm south of, Velva, ND unknown Davenport Locomotive Works Used in coal mines in the area. Now on a farm off Hwy 41 near Ruso, ND. 0-4-0CA unknown, Austin, NV unknown Universal Dredge Mfg. 0-4-0CA 24" Hooper Eagan, Goldfield, NV private Universal Dredge Mfg. 12 0-4-0T 4'-8½" US Navy Rochester & Genesee Valley Railroad Museum, Rush, NY restoration Vulcan Iron Works (Wilkes-Barre) #2854, 1918 Formerly in tourist train service in a residential New York neighborhood. 2 0-4-0T 4'-8½" Ashland Iron & Mining (Ohio River Coal) behind Sherry's Do Ups, Main St, Amelia, OH restoration Cooke Locomotive & Machine Works #61827, 1920 was displayed at Lunken Airport Playfield and later in Oakley, OH. 1 (6) 0-4-0VB 4'-8½" B&O Carillon Historical Park, Dayton, OH display B&O (Mount Clare), 1835 Named John Quincy Adams. Oldest surviving American built locomotive. 0-4-0 36" Pyrite Mine woods off US 17, Bealeton, VA private Baldwin, 1890s Pyrite Mine Named Dinky, to Stafford? 8 0-4-0T Consolidated Sand and Gravel (Ironton Solvey Coke) Lester Manor, King William, VA display Vulcan Iron Works (Wilkes-Barre) #2882, 1918 From Tredegar Iron Works, Richmond, VA. Owned by Carroll Lee Walker. 2 0-4-0T 4'-8½" Santa Cruz Portland Cement Northwest Railway Museum, Snoqualmie, WA operational H.K. Porter #4390, 09/1909 Named Chiggen. From Chicken Kitchen Restaurant, Pollardville, then Stockton, CA. 0-4-0T 600mm Rock River Thresheree, Edgerton, WI restoration Henschel & Sohn (Kassel) #22803, 1935 Named Spike, to be restored to operational condition.